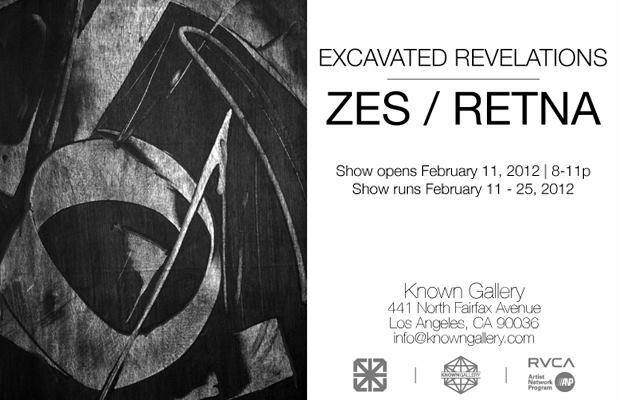 Known Gallery is proud to present Excavated Revelations, a dual exhibition featuring new work by Los Angeles-based artists ZES and RETNA. Introduced in their youth by their mutual friend AYER, ZES and RETNA led parallel lives through an upbringing in graffiti. Utilizing a fluidity and precision they mastered by painting some of the most coveted walls in the city, their refined technique is now exemplified in this fresh body of abstract work. ZES began his career at the young age of thirteen and gained recognition for his determination to climb some of the city’s most challenging locations, stealthily navigating the streets of Los Angeles and commandeering its obscure walls at night. Growing up in the heart of the city, by the age of fifteen, ZES became one of the youngest members of the legendary MSK crew and has helped define the contemporary graffiti movement. Widely respected for his innovations to West Coast wild style, his determination to overcome the obstacles the nature of graffiti presented resulted in a fervent approach to his modus operandi. His longevity has allowed him to produce a substantial amount of work on the streets, making him one of the most influential and recognized graffiti artists not only in the city, but also internationally, along with his contemporaries AYER, REVOK, and SABER. He has traveled from coast to coast in search of new environments that challenge him to climb higher and paint pieces that express his creative intensity. To this day, ZES can still be found on rooftops, ledges and fire escapes. RETNA is always brimming with new ideas. This past year alone, his work has been spotted everywhere from tail wings of jets to the walls of the Museum of Contemporary Art. RETNA continuously pushes personal, artistic and physical boundaries as demonstrated in Excavated Revelations. In this exhibition, he challenges himself with various methods including etching, the most esteemed technique used for master printing. The age-old process utilizes zinc plates, produced and manipulated through washes and resists and placed in a bath charged with an electric current that physically “etches” the plate. An impression is then printed by running the plate and a sheet of paper through a press at about 2,000 pounds of pressure per square inch. The result is beautifully embossed into the paper.